The graphing calculator can be a very useful tool for checking your work with complex numbers. that there may be more than one way to arrive at an answer. the calculator in a+bi mode. decimal point key or in the catalog. Note: Complex numbers can be accessed from Real Mode (without placing calculator in a + bi Mode). 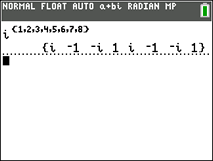 Real mode, however, does not display complex results unless complex numbers are entered as input. 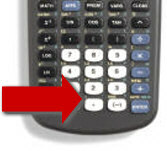 For example, if the calculator is NOT in a + bi Mode, will create an error. You get an error message when you try to enter the square root of a negative number when in Real Mode. You need to be in a + bi mode to evaluate the square root of a negative number. Divide : (2+3i)/(4-3i) (answer appears in a + bi form) WOW!! The calculator did the conjugate work for you. YEA! For TI-83+ and for TI-84+ with OS prior to OS 2.53MP. In this display, i is NOT in the denominator! The calculator is simply listing order of operations. Be careful to write your final answer correctly. but it cannot be written in the denominator with 25. 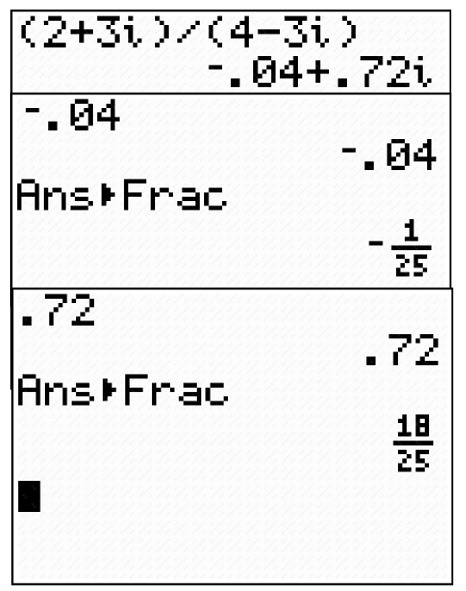 NOTE: On OS2.53MP or the CE, if the decimals you are trying to "grab" to convert to fractions are really long, use MATH - CPX - real( and imag( to "grab" the full decimal value for converting "a" and "b" to fractions. These values will appear when you are in either Real Mode or in a + bi mode. - 3E - 13 - i ??? This number is really just - i. - 3E - 13 is so small, it is considered to be zero. The older the calculator, the "sooner" you will start to see these scientific notation answers. TI-84+CE is OK through a power of 100. When raising i to a power on the graphing calculator, accuracy diminishes as the powers increase. that i178 is i2 which is -1. But it is actually just -1. 1. conj( returns the complex conjugate of a complex number. 2. real( returns the "a" value in an a+bi complex number. 3. imag( returns the "b" value in an a+bi complex number. 4. angle( returns the angle, or argument, of the complex number - the angle formed by the positive x-axis (the positive real axis) and the segment from the origin to the complex number point on an Argand diagram. 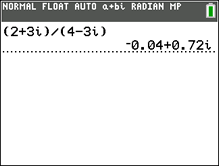 5. abs( returns the absolute value (magnitude) of the complex number.